Professor Jared Diamond did research in New Guinea, and became buddies with many natives. One day, a lad asked him why some societies became so rich, and others did not. Why are there haves and have-nots? White folks with European ancestors have done better economically than folks in New Guinea, and many other regions. To a number of dodgy white gits, this was absolute proof of their racial superiority. 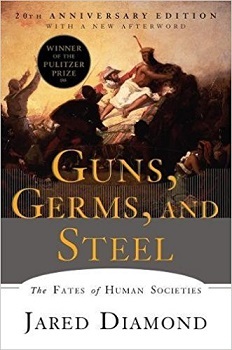 Diamond disagreed and explained why in his bestselling Pulitzer Prize winning book, Guns, Germs, and Steel. White folks did not become dominators via divine blessings, or genetic perfection. They were simply the winners of a lottery named geography, folks who happened to live in the right place at the right time. This provided them with big advantages over societies of equally intelligent people, of all other races, who had not won the lottery. Human history is a story that is maybe five million years old, and it sprouted in our African motherland. For almost the entire saga, our ancestors were hunter-gatherers who developed a low impact mode of living. By and by, the ancestors migrated into Asia, Australia, and Europe, where they invented clever new tricks for surviving in unfamiliar places. For Diamond, the excrement hit the fan around 13,000 years ago, when the Ice Age rode off into the sunset, and the planet warmed up and stabilized. By that time, about 80 percent of large mammal species had gone extinct. Most experts assign much or all of the blame on hunting. Big animals have a low rate of reproduction, and killing just a few too many each year can wipe them out over several centuries. It’s much less work to kill a 500 pound animal than it is to bag 500 bunnies. At that time, the Fertile Crescent was a fabulous place to live, situated between Europe and China. It was home to large herds of gazelles, and grasslands loaded with wild wheat, barley, and peas. Of course, abundant food tends to stimulate population growth. Eventually, the number of mouths reached the point where wild food resources became strained. Around 7500 B.C., farming and herding began displacing hunting and foraging. Food production was the ominous first step on the bloody path to guns, germs, and steel. Most of the wild grass species that produce large seeds live in Mediterranean climates, and the Fertile Crescent was especially blessed with these plants. It was home to several grain and legume species that were suitable for domestication. An acre of domesticated wheat could produce 10 to 100 times more nutrients than an acre of wild grassland. This was a unique situation. In our African motherland, which was south of the equator, the number of food plants suitable for domestication was zero. Of all the species of large herbivores in the world, only fourteen were suitable for domestication. One lived in South America, and thirteen in Eurasia. Diamond listed the traits that made a wild animal suitable for domestication, it “must be sufficiently docile, submissive to humans, cheap to feed, immune to diseases, grow rapidly, and breed well in captivity.” The Fertile Crescent was unusually lucky to be home to four wild animals that eventually became the most important domesticated livestock of all: goats, sheep, pigs, and cattle. This was a unique situation. In our beloved African motherland, zero large herbivores were suitable for domestication. Zebras were so wary of hungry lions that they refused to be owned and controlled. The older the zebra, the meaner. The guinea fowl was the only animal that all experts agree was originally domesticated on the continent. Thus, if humankind had remained in home sweet home, with nothing to eat but wild organic foods, we’d likely still be wild and free today, and Detroit and Paris would be hangouts for mammoths and buffalo. Livestock provided folks with meat, milk, fertilizer, hides, wool, and muscle power. When animals were milked, they provided herders with far more lifetime calories than could be consumed by simply killing and eating them. In different regions, folks milked cows, sheep, goats, horses, reindeer, water buffalos, yaks, and camels. Folks also rode on the backs of horses, donkeys, yaks, reindeer, and camels. Mounted cavalry radically redefined the rules for warfare and raiding. Beasts of burden were used to pull plows, carts, and sleds, and to haul loads of cargo on their backs. A serious downside of keeping livestock was being in constant close contact with large herds of animals. Many herders lived and slept close to their critters. This encouraged a number of animal pathogens to adapt to human hosts, like influenza, smallpox, tuberculosis, plague, measles, and cholera. As rising food production encouraged the emergence of civilizations and cities, this created perfect conditions for epidemic diseases, which thrive in filthy crowds. After Columbus landed in America, maybe 90 percent of Native Americans perished from Old World diseases. Indians didn’t have similar diseases to share with the white folks, because they kept few domesticated animals. Llamas and alpacas lived in small herds, and only in the Andes. They didn’t live in close contact with people, and people didn’t drink their milk. The big idea in Diamond’s book was about the axis of continents. In Africa and the Americas, the land base was taller than wide, spanning multiple climate belts. This north-south axis presented obstacles for the easy movement of people, livestock, crops, technology, and ideas. From north to south in Africa, the belts were Mediterranean, Saharan, rainforest, savannah, and Mediterranean. Eurasia had a huge land base, spanning from France to China. Generally, tropical climates (mostly hot) are found near the equator, arctic climates (mostly cold) are close to the poles, and temperate climates (hot & cold) are found between them. Food production and civilization emerged in the Fertile Crescent, which had a temperate climate. The east-west axis of Eurasia made it easy for people, livestock, crops, technology, and ideas to spread across the vast temperate zone. The early farmers and herders of the Fertile Crescent were living in a new-fangled way, with no traditional wisdom to guide them. They began a reckless joyride in trial and error, and gained tremendous expertise in error. The forests were mowed down, and erosion plugged up the valleys and harbors. Irrigation systems eventually made the soil so salty that it became infertile. Ravenous goats hungrily sabotaged nature’s every effort at healing. Over time, paradise largely became a desert wasteland. So, many survivors packed up and migrated to new homes. Some went east to China, others went west to Europe. Their brilliant plan was to repeat the same mistakes. In China, folks grew millet in the north, and rice in the south. Innovators developed a number of important technologies, like gunpowder, cast iron, navigation, paper, and printing. But you are not gazing at Chinese characters right now, because they did not colonize the world. China unified their empire in 221 B.C., and its culture was conservative — don’t rock the boat! Job One was to maintain order across the large complex society, so the friendly tax collectors could safely visit everyone. Europe, on the other hand, was a chaotic wild west — politically fragmented and terrifically competitive. In 1500, it was home to maybe 500 smallish states, spread out across many islands, peninsulas, and mountain valleys. Each was a hub of innovation. Job One was to avoid getting exterminated by ambitious enemies, and Job Two was to exterminate enemies at every opportunity. There was a nonstop arms race to develop more and better weapons, fortifications, ships, steam engines, and so on. Technologies and ideas moved with great speed back and forth across the continent. Consequently, Europe was the region that colonized the world, spreading across the temperate regions of North America, South America, northern and southern Africa, southern Australia, and so on. Anyway, Diamond presented many competent answers to the question of why some societies are haves, and others are have-nots — mission accomplished. I’ve only mentioned a few of his many points here. The black hole in the book is a more important question. The book presumes that it’s cool that some societies are in the “haves” category. Ecological sustainability is off the radar. There is one sentence with a whiff of doubt: “If those first farmers could have foreseen the consequences of adopting food production, they might not have opted to do so.” Obviously! The twenty-first century way of life would have totally terrified them, an overwhelming horror show of unimaginable craziness and destruction. Of course, the book was written in 1997, when Earth was home to a wee herd of 5.8 billion. In those days of love and innocence, climate change and energy limits were still largely paranoid fantasies among the lunatic fringe. Every year, thousands of college students are required to read Guns, Germs, and Steel. They are spending a fortune on tuition, hoping to devote their lives to climbing up the hierarchies, living as lavishly as possible in the Empire of the Haves, and overloading landfills with the discards of their infantile opulence. They are not being prepared for the advancing storms that will eventually pummel their generation. Diamond added an afterword section to the 2003 reprint of his 1997 book. Bill Gates loved it. Diamond was contacted by numerous corporate leaders seeking guidance. “What is the best way to organize human groups, organizations, and businesses so as to maximize productivity, creativity, innovation, and wealth?” Our culture’s worldview only has one channel, perpetual economic growth — another joyride having no guidance from traditional wisdom. Full speed ahead! Diamond, Jared, Guns, Germs, and Steel, W. W. Norton & Company, New York, 1997. National Geographic produced an excellent three-part (3 hour) documentary on Jared Diamond and his book. Go HERE. In history classes, students struggle to memorize and regurgitate the names, dates, and places essential to our glorious myth — the sacred journey that brought us to the miracle of today. For many, this parade of dusty factoids is the story they will believe for the rest of their days. What I was taught about Christopher Columbus resembled a kindergarten fairy tale — the courageous hero succeeds. Hooray! The last 50+ years have released a flash flood of important new information. Our planet is being disemboweled by seven-point-something billion humans racing down a hell-bound path for no good reason. Alfred Crosby was an important pioneer in the field of environmental history. In his book, Germs, Seeds, and Animals, Crosby described how the Columbus voyage of 1492 detonated a global ecological catastrophe. It was a monumental event in the human saga, something like an asteroid strike. When the Pilgrims washed ashore at Plymouth Rock in 1620, they were not immediately exterminated by Wampanoag warriors, because the tribe was nearly extinct. Smallpox got there first. Pilgrims found an empty village surrounded by cornfields full of weeds. During the first winter, half of the colonists died from malnutrition, exhaustion, and exposure. They knew almost nothing about surviving in a foreign ecosystem. Pilgrims struggled to survive on shellfish, and on corn (maize) that was bought or stolen from the Indians. It wasn’t until 1624 that they figured out how to live on their own. Native Americans were spooked by the freaky aliens. Everyone around them was dead or dying, while none of the aliens were molested by evil spirits. Deadly diseases, especially smallpox, spread from tribe to tribe, across vast regions, well in advance of explorers and settlers. Natives could have easily exterminated the Pilgrims, but they were fearful of their horrific dark powers. Without smallpox, history could have taken a radically different path. The Pilgrims came from a densely populated civilization that had transformed its thriving rainforest into fields, pastures, and disease-ridden cities. In Europe, smallpox had raged for centuries. Around 1500, the virus mutated into a far more virulent form, killing many children in cities near the Atlantic coast of Europe. Folks who survived to adulthood were those lucky to have unusually robust immune systems. It was these folks who carried smallpox to the New World in 1518, where it killed up to half of those infected. The virus could unintentionally be transported via a trunk of clothing. Human-to-human contact was not needed. In an era of long distance sea travel, ships often returned to Europe with new and exciting diseases from every corner of the Old World. Many deadly diseases originated in domesticated animals, with whom Old World people often lived in close contact. A number of livestock pathogens were able to transfer to human hosts. These germs especially loved infecting dense crowds in filthy cities. Epidemics of assorted diseases bounced from region to region on a regular basis. Native Americans, who did not enslave herds of animals, had only two indigenous pathogens, Chagas’s disease and Carrion’s disease. Spaniards documented the die-off in Mesoamerica (Aztecs) and Peru (Incas), where 90 percent of the Native Americans were dead within a century. In these cooler highland regions, folks died from temperate diseases, primarily smallpox, measles, whooping cough, and pneumonia. In the hot, wet coastal lowlands, people not only died from temperate diseases, but also tropical diseases, like malaria, yellow fever, dengue fever, and amoebic dysentery. Around 1590, an observer estimated that 29 of every 30 lowland natives had perished from disease. As a special bonus, Europeans also brought chicken pox, typhus, typhoid fever, bubonic plague, cholera, scarlet fever, diphtheria, and influenza. To this day, Old World diseases continue killing natives who come into contact with outsiders for the first time — missionaries, loggers, miners, etc. By far, the primary reason Europeans conquered the Americas was disease. I was surprised to learn that Europeans did not intend to exterminate the natives and replace them with settlers. Colonists suffered from get rich quick fever, and the fast path to wealth was to control and exploit multitudes of Indians. Unfortunately, the native workers rapidly died from disease, malnutrition, and abuse. This labor shortage inspired a rapid expansion of the highly profitable slave trade. Africans were less vulnerable to the tropical diseases, for which white folks were helpless sitting ducks. At least ten million slaves arrived alive in America. Millions more perished before setting foot ashore. Once here, their death rate was higher than births, which kept the slave industry booming. Old World livestock thrived in the New World. The new ecosystem had abundant vegetation, was free from Old World pathogens and parasites, and wild predators were not a serious threat. Animals grew faster and larger, and had more offspring. On the pampa of South America, where few humans lived, feral horses and cattle multiplied into huge populations — they had no buffalo to compete with. Corn (maize) was a super-productive crop. Sowing a bushel of wheat might yield 12 to 20 bushels at harvest time. A bushel of corn might yield 200 bushels or more. Corn could be grown using simple tools and unskilled labor. It could be grown on marginal soils, required minimal weeding, and could survive several frosts. It stored well. Husks discouraged losses to birds. When mature, ears could be left on the stalk and harvested later, without risk of spoilage. Settlers in America were far better nourished than the sickly mobs of Europe. Most lived in rural areas, in low density, which discouraged epidemics. They bred like crazy, and many of their kiddies survived to adulthood. Folks had access to abundant land for expansion. By 1775, the U.S. population was doubling every 25 years. In 1790, half of Americans were younger than 16 years old. Meanwhile, Europeans took corn, potatoes, and treasure back to the Old World, where they blindsided almost everything. Corn became a staple in southern Europe. For many folks, it was their primary food. Because it lacks the essential nutrient niacin, many poor folks came down with pellagra. Around the world, in the eighteenth and nineteenth centuries, hundreds of thousands died from pellagra. The simple cure was a slightly better diet. Potatoes were widely adopted in northern Europe, where they produced far more nutrients per area than traditional grain crops, which were vulnerable to molds, fungus, and cool weather. A family of five could survive on 5 acres (2 ha) of grain, or just 1.5 acres of potatoes. Folks remained healthy on a daily diet of 11 pounds (5 kg) of potatoes and some milk (another source said 10 pounds). Potatoes contained vitamin C, so far fewer died from scurvy during winter months. Farmers could raise them on marginal soils, using only a spade. In wartime, invaders could easily steal stored grain, but buried spuds were often too much effort to swipe, so fewer farmers starved. Gold, silver, and gems were hauled back to Europe. This provided a flash flood of new wealth, which greatly expanded the global economy. Manufactured stuff went to the New World, and resources sailed back to Europe. The wealth surge provided the capital needed to jump start the Industrial Revolution. Because potatoes and corn were highly productive, less cropland was needed. So, many peasants were forced off the land, to make room for sheep, which generated more profit. Mobs of displaced people migrated into cities, where they provided cheap labor for industry. After the 1666 epidemic in London, the plague largely went dormant in Europe. This spurred population growth, which intensified urban filth, and provided ideal conditions for the cholera epidemic that arrived in 1829. Aided by potatoes and corn, both Europe and America were able to harvest far more food. People were better nourished, so child mortality dropped. The population of Europe leaped from 80 million in 1492, to 180 million in 1800, and 390 million in 1900. Europe was bursting with people, and many migrated to colonies — Australia, New Zealand, southern Brazil, Uruguay, Argentina, Canada, and the U.S. Bottom line, world population leaped from 450 million in 1500 to 7.5 billion in 2018. 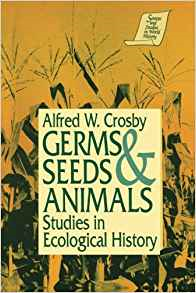 Crosby, Alfred W. Germs, Seeds, and Animals: Studies in Ecological History, M. E. Sharpe, Armonk, New York, 1994. Other Crosby books I’ve reviewed are Children of the Sun, and Throwing Fire.